A new operating schedule for the Hainan East Ring Railway will take effect at midnight next Wednesday. According to the railway authorities, there will be 28 pairs of trains serving the railway altogether. 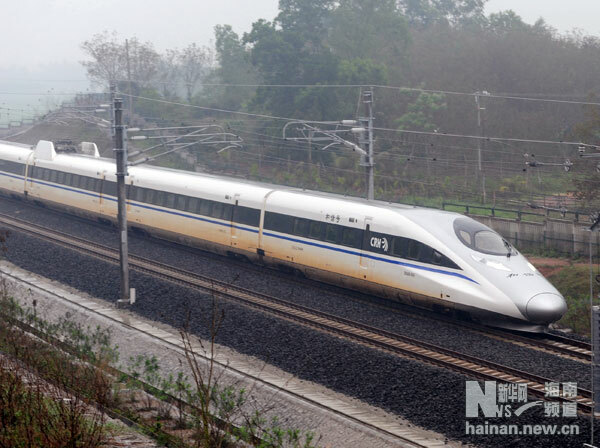 3.5 pairs of trains will run from Haikou Railway Station to Sanya Railway Station, while 24.5 pairs will run from Haikou East Railway Station to Sanya Railway Station, up 6 from 18.5 pairs. Railways official said, with the current operational speed of 200 km per hour, the plan to adjust the operation of the railway is to shorten bullet trains wait time and stops for the full use of transport capacity and further improve service quality. During the new train operation, 3 pairs of trains will run between Haikou East Railway Station and Sanya Railway Station. Timetable for departure from Haikou East are set at 10:10am, 15；50pm and 20:30pm, while from Sanya are at 9:00am, 12:00pm and 20:30pm. The whole journey will take 1 hour and 34 minutes.